Padua’s Botanical Garden is a sight you shouldn’t miss in the region of Veneto, Northern Italy. Billed as the world’s oldest University botanical garden that is still in its original location, it was founded in 1545. Among other things it houses a 432 years old palm tree which inspired Goethe himself to describe his evolutionary theory in the ‘Essay on the Metamorphosis of Plants’. Padua’s Botanical Garden is also a UNESCO World Heritage Site with over 7000 botanical species and some impressive architecture. Its old part – the Historical Garden – is in the shape of a circle (symbolizing the world) enclosing a square, which is then divided into four smaller squares. Fountains and water features are strategically positioned all throughout making it a lovely place to visit even on a hot summer day. The new part – the Biodiversity Garden – was opened in September 2014 and gives you a chance to walk through all the different climates in the world – from the aridest to the most fecund – and admire the vegetation native to each one of them. There are two things that I love the most about the modern building of the Biodiversity Garden. One is the waterfalls which cascade from the rooftops of its entrances down to the rectangular lily ponds in front of the building. 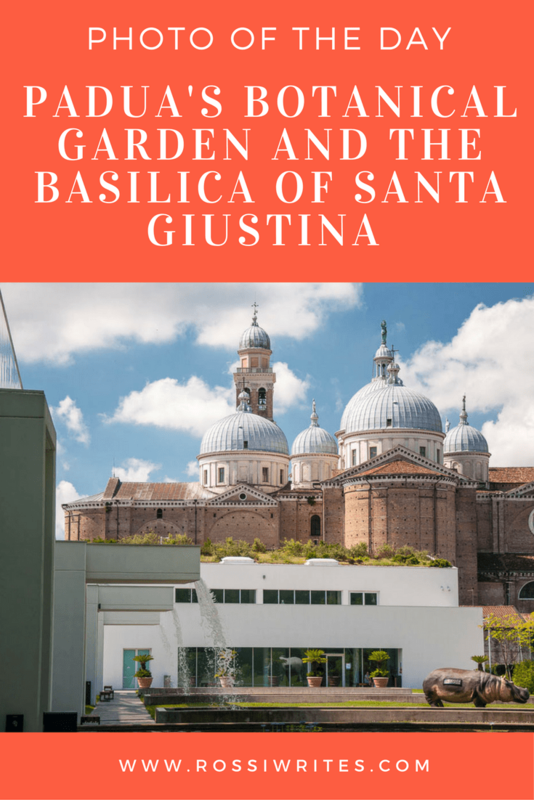 And the other is the contrast between the sleek architecture of the Biodiversity Garden and the monumental domes of the Basilica of Santa Giustina – a Benedictine church originally built in the 6th century and then remodeled in the 17th century. Visually, for me this represents the perfect juxtaposition of science and religion. Or the perfect symbiosis of the two, maybe. Especially, considering that, originally, in Italy it was monks and even a pope (Nicholas V) who would set up and grow medicinal gardens which were used, among other things, to promote the teaching of botany. It’s difficult to tell which it is – a juxtaposition or a symbiosis. It can be seen from so many different angles and different people can argue their different points of view til they are blue in the face and yet not achieve a mutual agreement. So, I don’t want to open a debate here, just to show you how beautiful the Biodiversity Garden and the Basilica of Santa Giustina look together. And I also want to encourage you to visit the Botanical Garden when you find yourself in Padua. The place is a green oasis with many curious and beautiful plants to look at. It is of high historic and academic value too as it is an institution still actively working in its field of science close to 500 years after it was originally established. Don’t forget to let me know if you have already visited Padua’s Botanical Garden! What did you love the most there? Which was the plant you found the most interesting, curious or simply beautiful?